We own an exclusive contract with Genea – World leading fertility. The Australian clinic Genea began to deal with IVF as the first in the world, and still is the absolute leader in the field. They are fully dedicated to research and development of new technologies. Thanks to the cooperation with Genea, Sanatorium Helios can be currently considered one of the most successful IVF centres in Europe. We also provide outpatient gynecological care, genetic counseling, cancer prevention, and surgical treatment. This cooperation gives us the opportunity to use new techniques and technologies before they come into common usage. – We were the first centre in Europe performing PGD on blastocysts – 2006 PGD (FISH), 2007 PGD (PCR), 2011 PGD / PGS aCGH. Sanatorium Helios is a centre for assisted reproduction with tradition of more than 20 years. The head doctor and IVF specialist is Pavel Texl MD, who has founded the clinic himself. Not only Czech patients, but also couples from Italy, Slovakia, and other countries are successfully being treated here. Doctor Texl has been active in the field of reproductive medicine for more than 30 years. He was a part of the team which brought the first child in the Czech Republic into the the world through assisted reproduction. 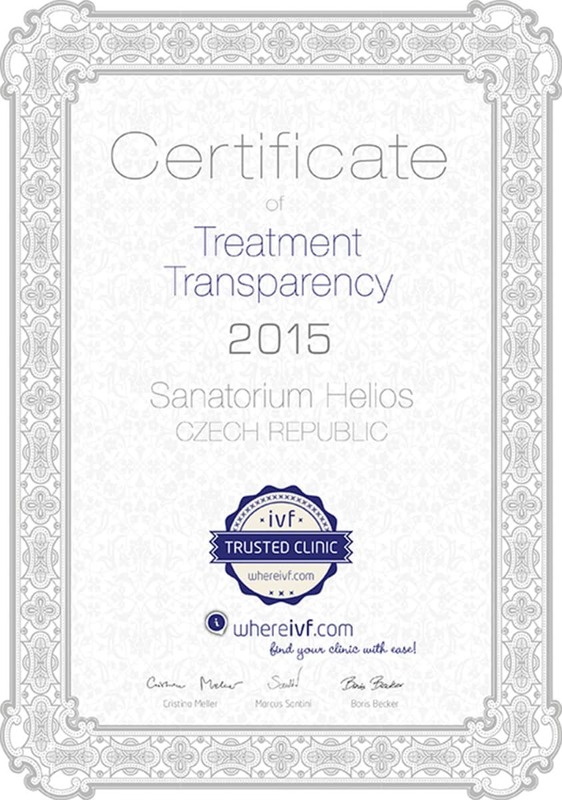 In Sanatorium Helios we collaborate with other European clinics in Italy and Slovakia. Our doctors and IVF coordinators speak English, German, and Italian. We provide all the currently available methods of artificial fertilization. We do not use outdated methods such as embryo culture in common incubators, slow freezing, transfer of two or three-day-old embryos, or transfers of multiple embryos, which are still quite common in other centres. Embryo culture takes place in special miniincubators. Standardly we do extended 5-day culture to the blastocyst stage, and our pregnancy rates are very successful after transfers of thawed embryos. Thawed embryos survive almost in 100 % cases thanks to sensitive ways of freezing. We offer not only our expertise, but also discreet, empathetic, and individualized approach. 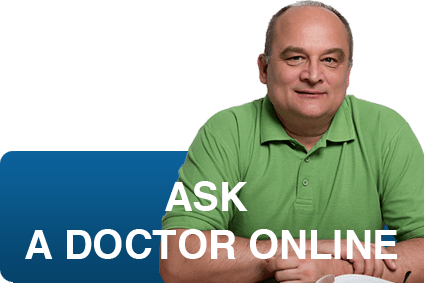 For our patients we always want the best care and we do not want to put them into a position, when they should decide which methods of various success rates they should choose according to the price. Each couple needs a personal solution to their specific situation. Come and see yourself. We invite you to a non-binding personal consultation with our IVF specialists, who will schedule an individual treatment strategy according to your specific needs. Our clinic is open 7 days a week. On weekdays, holidays, or weekends, we are always available to provide necessary medical care, regardless our comfort. Only in this way can we achieve optimal results in the treatment. We perform oocyte pick ups and transfers when necessary – whether it is on Sundays, Bank Holidays, or Easter. Outside our opening hours there is a coordinator, who speaks your language, available to you via phone. We have an extensive database of donors, who had undergone all the necessary examinations. Based on your blood group and looks we are in most cases able to find an appropriate donor immediately. An egg donor is always designated for only one recipient. Our egg donors are young women under 32. Our donors repeatedly undergo tests for sexually transmitted diseases (HIV 1 and 2, hepatitis B and C, syphilis, chlamydia), and are subjected to psychological interview and have negative results in genetic testing. 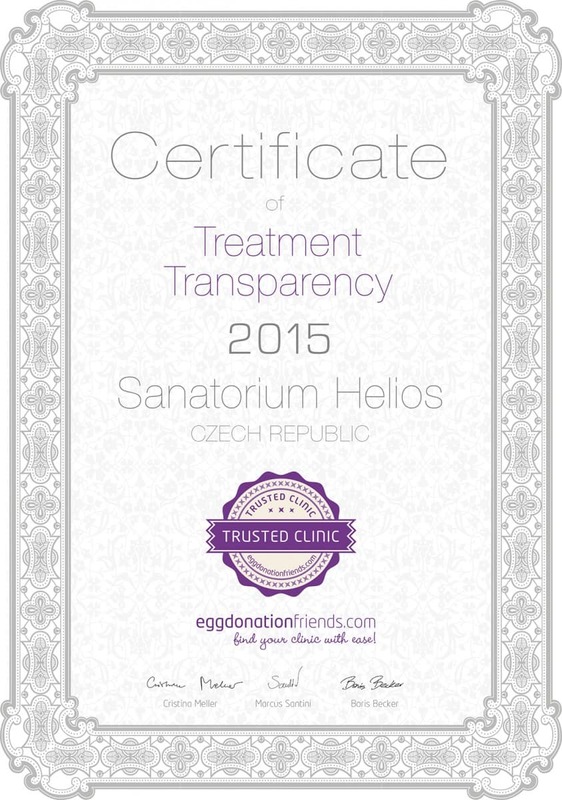 Egg donation is completely anonymous acording to the Czech law. We have been achieving 50% success rate of clinical pregnancies with fetal cardiac events for the last 5 years. When using a PGS – preimplantation genetic diagnosis of embryos, the success rates increase up to 70% using only one embryo at the blastocyst stage per transfer. Concerning our donor programme, we have a 70% success rate. These success rates are calculated out of pregnancies confirmed by ultrasound examination. During you treatment, we provide you with maximal comfort and convenience. Sanatorium Helios is located in the city centre with its own private parking lot. Or our staff will provide transportation from the airport any time needed. In the building of Sanatorium Helios there is a guesthouse and a restaurant. The rooms are equipped with air conditioning, television, radio, Wi-Fi and a refrigerator. Meals in the restaurant are tasty and prepared from fresh local ingredients. Sanatorium Helios has been maintaining a quality management system according to EN ISO 9001since its establishment in 1994. For more than 10 years we have worked as the exclusive licensee of the company Genea in the Czech and Slovak Republics. In 2014 our Laboratory of Medical Genetics and our IVF Laboratory acquired the certificate of accreditation according to DIN EN ISO 15189, which is the highest possible rating of quality of work in laboratories.